Tuesday, June 9 1908 -- Herriman adds a little liveliness to this front page photo portrait of a political triumvirate. 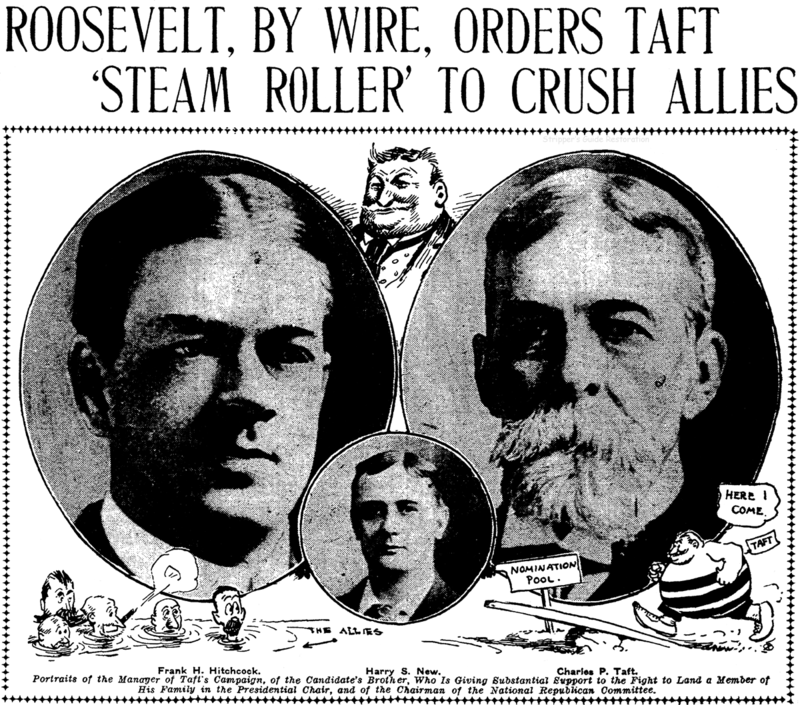 These are the men who will shepherd William Howard Taft, ally and groomed successor of Teddy Roosevelt, to the nomination of the Republican party. The city near the Mars-sur -Allier American Base Hospital is Nevers, not Navarre. My father was at the Mars Hospital as a medical assistant and wrote for The Martian. I have a complete set of the Martians. My father met and later married a young woman of the nearby village of Moiry. I am very involved in the village and have contributed photos, writings etc. about the Mars Hospital Camp. The village is preparing for the 100th anniversary of the arrival of the Americans there in 1917. I have published a book of my mother's stories about life in her village in the early part of the 20th century: Vignettes de Moiry in French and Vignettes of Moiry in English. One of my friends in Moiry who is passionate about this history sent me the information about Al Zere. Fascinating! Connie, October 18 1936, courtesy of Cole Johnson. Follow the Connie story every Friday here on Stripper's Guide. Al Zere was the professional name of Alfred George Ablitzer, who was born in Brooklyn, New York, on July 4, 1889. His full name and birth information is from his World War II draft card. I came across two cases in which his surname was spelled with a second “e”, Ablitzere. In the 1900 U.S. Federal Census, Zere was the seventh of eight children born to Pierre, a tailor, and Stephanie, both French emigrants. The family resided in Brooklyn at 463 Carlton Avenue. According to the school’s yearbook, The Oracle, Zere attended Adelphi College, in Brooklyn, during the years 1906 and 1907. “Ablitzere” was the spelling in the 1907 Oracle. By 1910, just Zere and a younger sister were living with their parents in Brooklyn at 241 Wyckoff Street. Zere was a newspaper artist. After studying art seriously, he got a job painting china dishes. He didn’t like the work and didn’t want to quit, either. So he got himself fired in a week by breaking so many dishes the firm couldn’t afford to keep him. “Zere” was born in Brooklyn and studied art at Adelphi College, under the tutorship of J. B. Whitaker, the noted landscape painter. He won several medals for drawing and painting and was considered one of the most promising students. Soon he got a job on the Brooklyn Eagle. His pay was nothing a week. His work was to experiment on comics. When he finally got up Buttons & Fatty, a strip about two bell boys, his pay was raised. Buttons & Fatty, begun twelve years ago, is still a Brooklyn Eagle feature, drawn now by another artist. In June 1917, Zere signed his World War I draft card which said his address was 82 71st Street in Brooklyn. He was a Brooklyn Daily Eagle cartoonist whose description was medium height and build with blue eyes and blonde hair. He joined the army as a private when the World War began. He was yanked from drill to teach wounded soldiers how to draw. He was offered a commission but refused to remain at this work, feeling the lust for adventure, and went overseas. But there too he was yanked from the force and sent to Navarre, France, to run a newspaper called the Martian in the big hospital center at Mars. This is the first page of The Martian, a little newspaper, published by the organizations at Hospital Centre. A.P.O., No. 780, American Expeditionary Forces, Mars-sur-Allier, France. If there is something about the drawing that forms most of the cover design that seems familiar to you it is because the drawing is by Zere, who drew so many pictures for the Junior Eagle and who introduced Buttons. Fatty and Sonia, to you. Zere’s full title and name is Sgt. Alfred G. Ablitzer. He is business manager and cartoonist of The Martian. Cor. Edward A. Ruhfel, who was editor of theca Junior Eagle until be enlisted, is associate, editor of tho paper. Neither Sgt. Ablitzer nor Cor. Ruhfel expects to be home soon, both having elected to stay for study in France for a few months more. If you want to write to them you can address your letter to them in care of The Martian, copying the address as given above. They will be glad to hear from readers of The Junior Eagle. Associated with him on this newspaper was Edward A. Ruhfel, now financial editor of the Brooklyn Eagle. After the war be continued Buttons & Fatty for the Brooklyn Eagle and also started a new feature section for that paper. 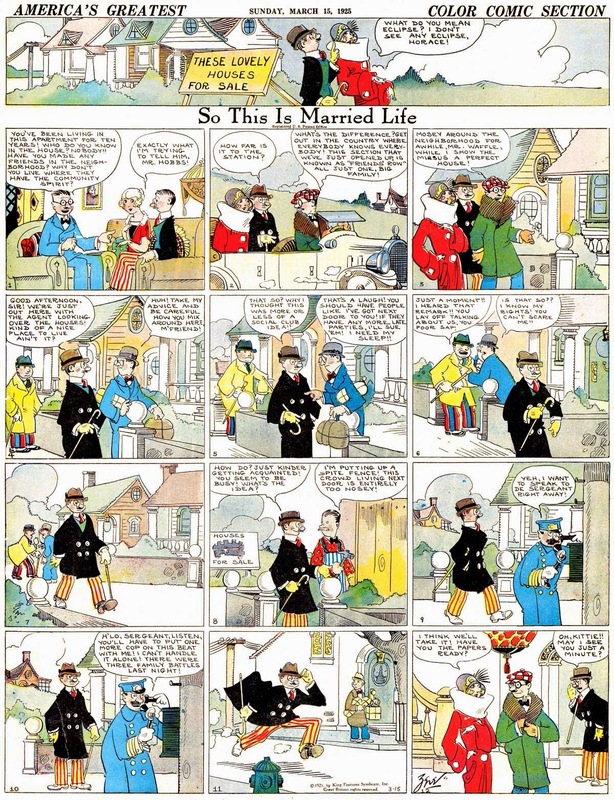 He was soon called to work on the New York Evening Post, where he did a general cartoon and later Man the Master, his first married life strip. When the Post changed hands he was sent for by King Features Syndicate and started So This Is Married Life! 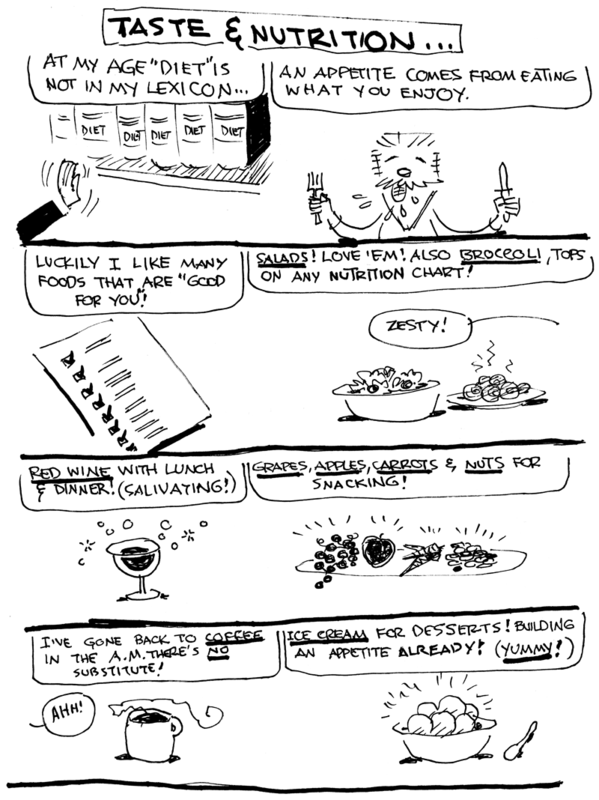 In this strip he details the adventures of Mr. and Mrs. Waffle. He does not go in for “gags” as much as for simple human interest stuff and a certain continuity from day to day in the adventures of the pair. Once in a while “Zere” hops over to Europe. He can speak French fluently, in fact served as an interpreter during part of the war time. “Zere” is active in sports, particularly tennis. According to the 1920 census, Zere, his sister and mother resided in Brooklyn at 82 71 Street. 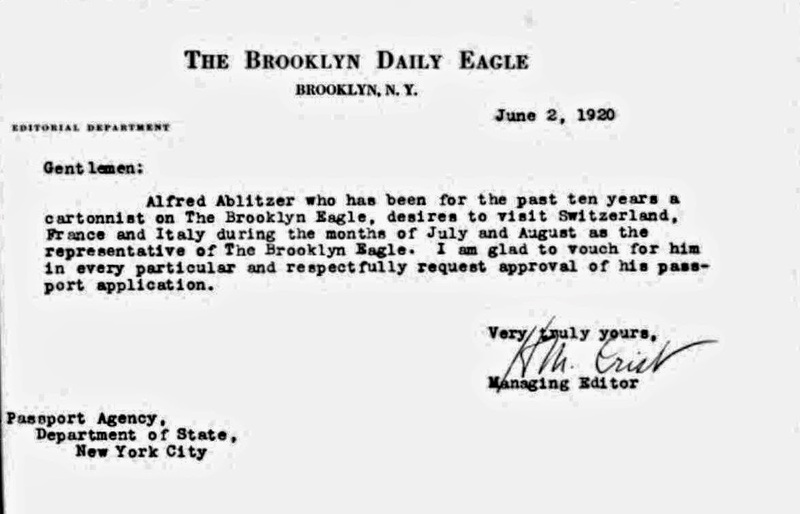 On June 2, 1920, Zere applied for a passport to visit France, Switzerland and Italy for “pleasure and professional representative.” At the time he was an illustrator and cartoonist, residing at 78 72nd Street, Brooklyn. Attached to the application was a letter by his brother Pierre who certified that Zere was his brother. The letter was notarized by another brother, Edward. Also attached was a letter, below, from the managing editor of the Eagle. 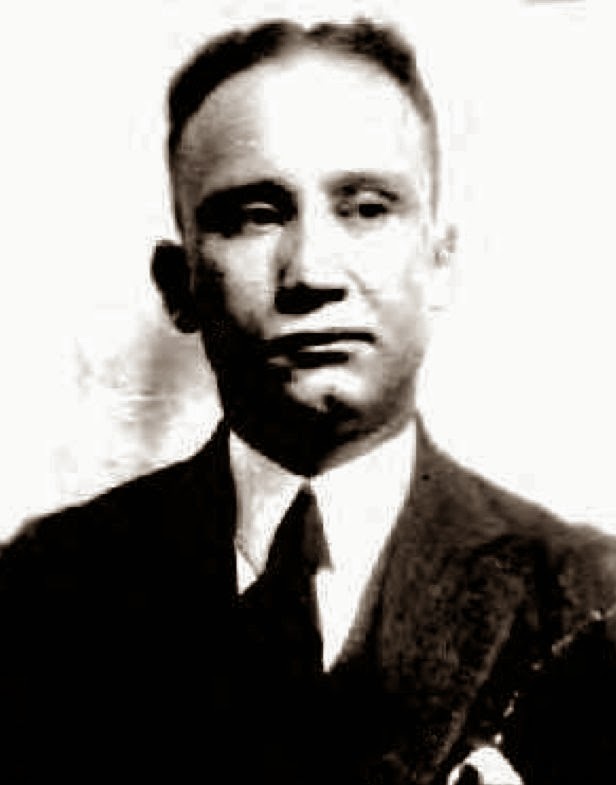 In addition to his 1920 trip, he sailed to Mexico in 1922; to Bermuda in 1925; and to Europe in 1926. I naturally assumed that “Zere” was married, else how could he picture wedded life with such fidelity? But when I asked him, I found that I had been mistaken. A friend of mine got married not so long ago and at the feast he was called upon to respond to the customary toast to the bridegroom. Miss Biedermann is the daughter of Mr. and Mrs. Louis Biedermann of Hollis, L. I., who have announced her engagement to Alfred G. Ablitzer of Bay Ridge. Mr. Ablitzer is the artist whose pen name is “Zere.” The wedding will take place in the near future. The New York, New York, Marriage Indexes, at Ancestry.com, said they married on March 17, 1928 in Manhattan. Later that day they went on a cruise. The passenger list said they lived at 6820 Ridge Blvd., Brooklyn. Weekend guests of Mr. and Mrs. Al Zere, Hollis, at their Summer home, “Woodland Echoes,” included Jack Shuttleworth, editor of “Judge” magazine, his wife and son, Jack Shuttleworth Jr., and Mr. and Mrs. Charles Forbell. ...Right now, Ablitzer and the Mrs., who was Henrietta Biedermann of Jamaica before her marriage, are at their summer home on Shelter Island. Mr. Ablitzer spends all of his spare time fishing for weaks and blues in Peconic Bay and raising wire-haired terriers. In the winter months, the Ablitzers live at 193-02 100th avenue, Hollis. They have no children. The 1940 census recorded them in Forest Hills at 98-120 Queens Boulevard. He continued as a cartoonist. On April 26, 1942, he signed his World War II draft card. United Features Syndicate was his employer. Platter lips make Miss Ubangi the belle of her tribe, but she doesn’t suffer any more than the American girl who insists on wearing high heeled shoes a size too small for her, according to Al Zere, Forest Hills artist. Zere, a resident of Africa for two years, is attempting to recreate in clay the “beauties” of various African tribes. 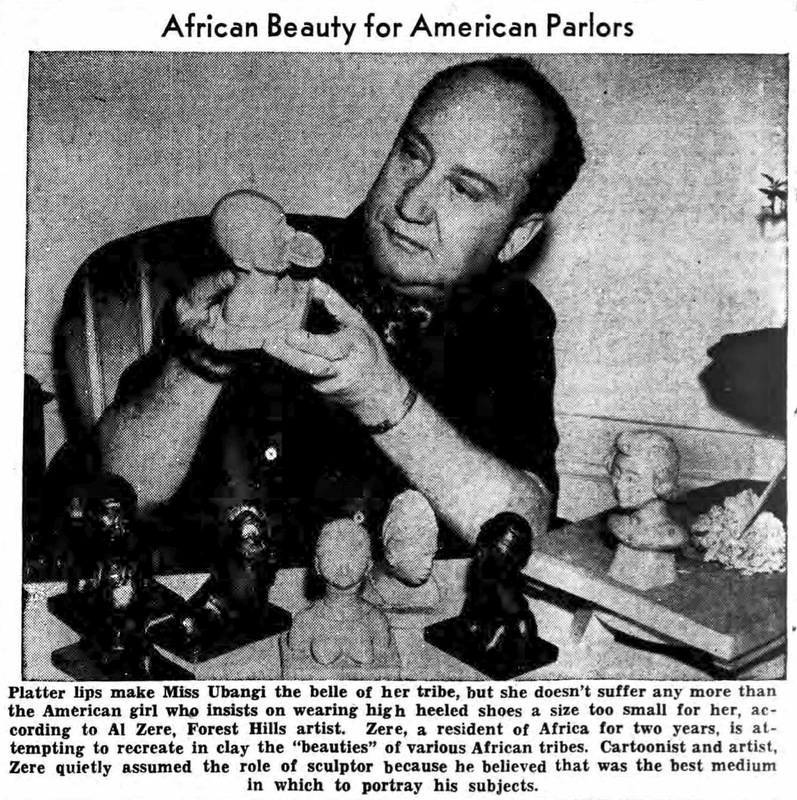 Cartoonist and artist, Zere quietly assumed the role of sculptor because he believed that was the best medium in which to portray his subjects. According to American Newspaper Comics (2012), Zere produced over a dozen comic series including Susie Sunshine and Flossie. 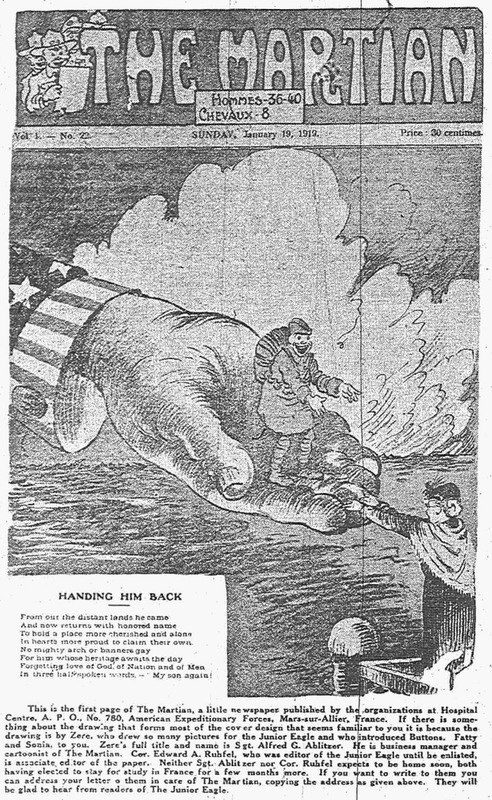 Man, the Master began January 27, 1920 in the Brooklyn Eagle, where it appeared once or twice a month on the front page. 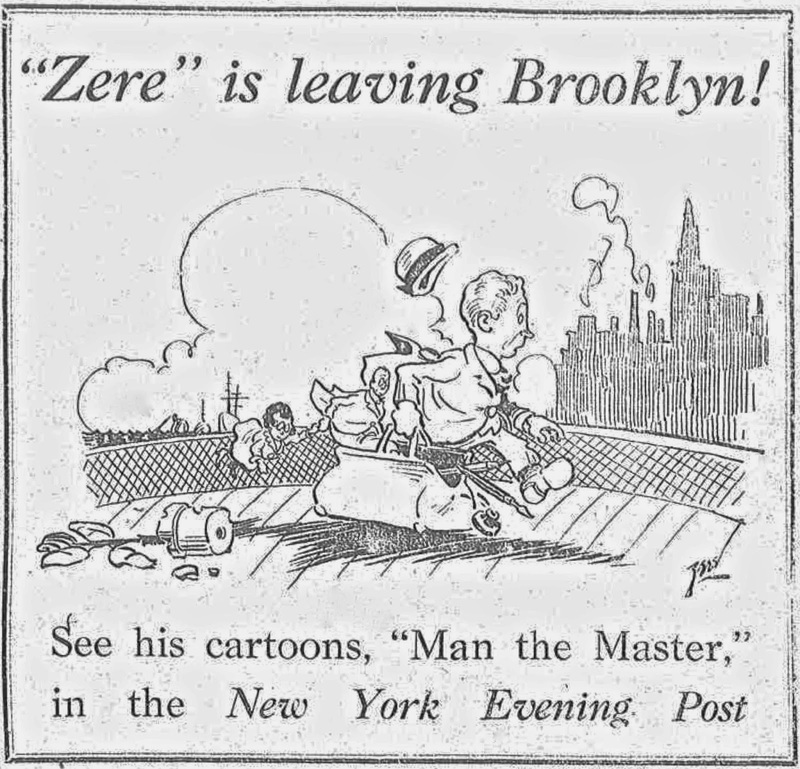 In November that year, Zere moved to the New York Post where Man, the Master debuted on the 16th and may have ended September 1 1922. A photograph of Zere at his drawing board is here. Zere passed away November 1968, according to the Social Security Death Index. Didn't AL ZERE also work under the name ﻿JOURDAIN for Harvey maybe??? Marvin Poole “Brad” Bradley was born in Streator, Illinois on January 16, 1913, according to Who’s Who in the Midwest (1960). The 1910 U.S. Federal Census said his parents were Edwin and Edith (Poole). Edwin's World War II draft card said he was a salesman for the Johnson Refining Oil Company. He passed away October 3, 1918. The 1920 census recorded Bradley in Bruce, Illinois, where his maternal grandfather, Charles Poole, a fruit farmer, was head of the household. Bradley was the second of three brothers. Their mother was a nurse. Who’s Who said he was a scholarship student at the Chicago Academy of Fine Arts, from 1929 to 1930. In the 1930 census, he lived in Chicago at 8753 Honore Street. His mother had remarried to Roderic Wyse, and his maternal grandmother, Alma, was head of the household. According to Who’s Who, Bradley attended the Fort Wayne (Indiana) Art School, from 1931 to 1932, then the John Herron Art School, in Indianapolis, from 1933 to 1934. He was a portrait artist for the next four years. In 1938 he collaborated with Edwin Balmer and Philip Wylie on Speed Spaulding until 1940. He divided his time between Ramblin' Bill and Mary Worth. The 1940 census recorded him in Chicago at 210 East Erie Street; he was a syndicated cartoonist. Who’s Who said he married Dorothy M. Jones on February 21, 1942. The U.S. Department of Veterans Affairs BIRLS Death File, 1850-2010, at Ancestry.com, said he enlisted September 9, 1942. Editor & Publisher, February 8, 1986, said he was a World War II Air Force pilot. One of his portrait drawings, while stationed in China, is here. Perhaps his most enduring work was on the strip, Rex Morgan, M.D., which began May 10, 1948. Bradley retired from the strip in 1984. The writer, Dr. Nick Dallis was profiled in Popular Science, September 1956. The profile said Allen Saunders (Mary Worth and Steve Roper) introduced Dallis to Publishers Syndicate, Bradley and artist Frank Edgington. Bradley passed away January 10, 1986 at his home in Tower Lake Estates near Barrington, Illinois, according to the Chicago Sun-Times, January 12. Editor & Publisher said the cause was lung cancer. The U.S. Public Records Index, at Ancestry.com, has two Illinois addresses for him: 2 Berkshire Court, South Barrington, and 233 West Lake Shore Drive, Tower Lakes. 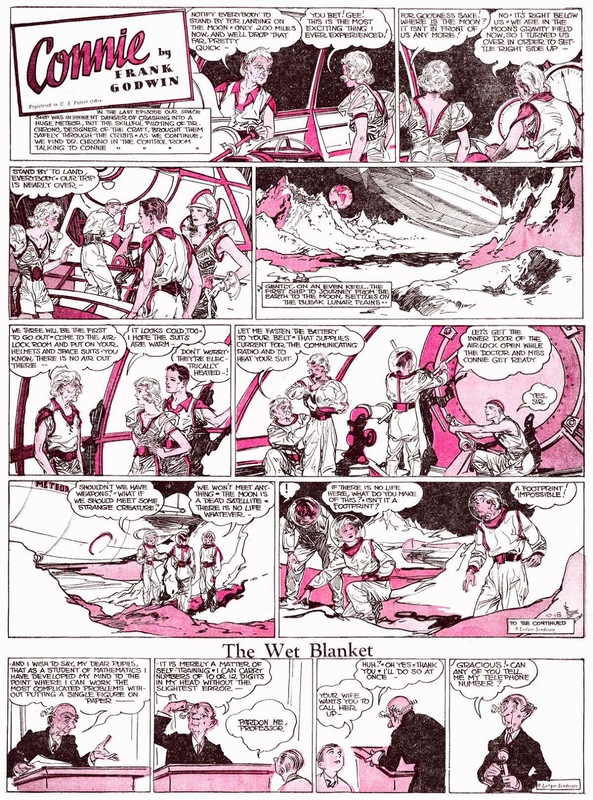 Vic Forsythe was always fascinated by the Wild West, and it often showed up in his comic strips. Early in his career, long before his big success with Joe Jinks, he was one of the hired hands in the bullpen of the New York Evening World. He cranked out a lot of material in those early days, and was already trying out Western themes on occasion. His first actual Western strip is this one -- Bad Bill, the Western Wildcat. Here Vic turns the stereotypes on their heads. There's a runty little milquetoast of a sheriff, a fellow who looks like he'd be more at home in a CPA office than keeping the peace in a lawless Western outpost, and a rootin'-tootin' outlaw named Bad Bill. But Bad Bill doesn't run roughshod over the pipsqeak sheriff. Turns out the lawman has a backbone of iron and a shootin' iron that always hits its mark. Every time Bad Bill gets up a good head of hell-raising steam, the sheriff calmly and quickly puts it out. Bad Bill, the Western Wildcat ran in the Evening World for just a short time -- November 10 to 29 1911. 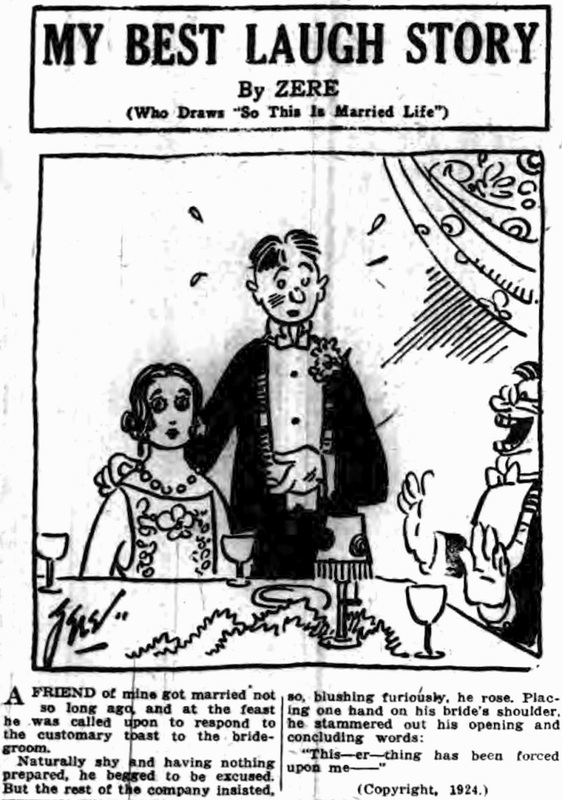 Vic already had a well-received strip that was running regularly there -- Flooey and Axel -- and though he would often try out new ideas like Bad Bill, they always seemed to peter out pretty quickly. Forsythe is listed in the cast as playing himself. Other players had fairly long silent, and in some cases talkie careers. Of note Margery Wilson who was an actress and film director in the silent film era and Max Davidson, a character actor from Germany, who played comical Jewish roles in many films including at least one Hal Roach Our Gang episode. He also starred in a series of short silent films. The movie appears to be among the many lost silent films, with no synopsis listed. Again thanks for the post. 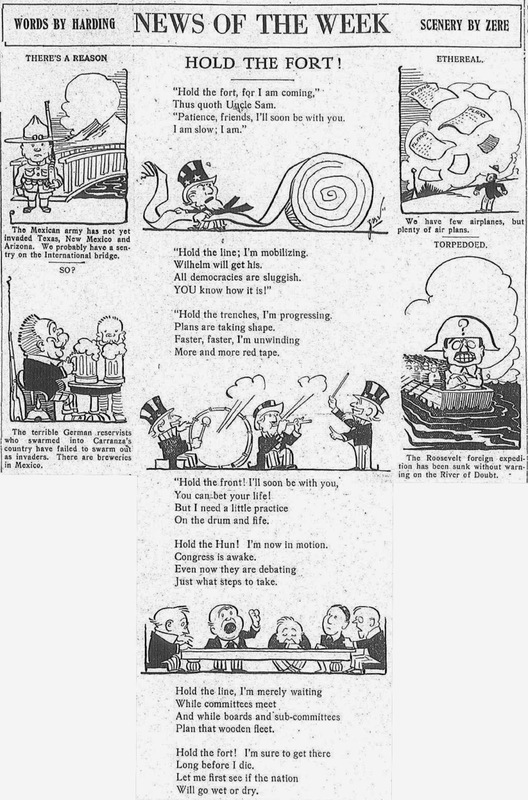 I'll cover Flooey and Axel here one of these days, but for now if you want to see the series, you can read it to your heart's content over on the Library of Congress website, in their run of New York Evening Worlds. Thank you so much for the info to go to the Library of Congress', New York Evening World's archives to see the Vic Forsythe Flooey and Axel strips. 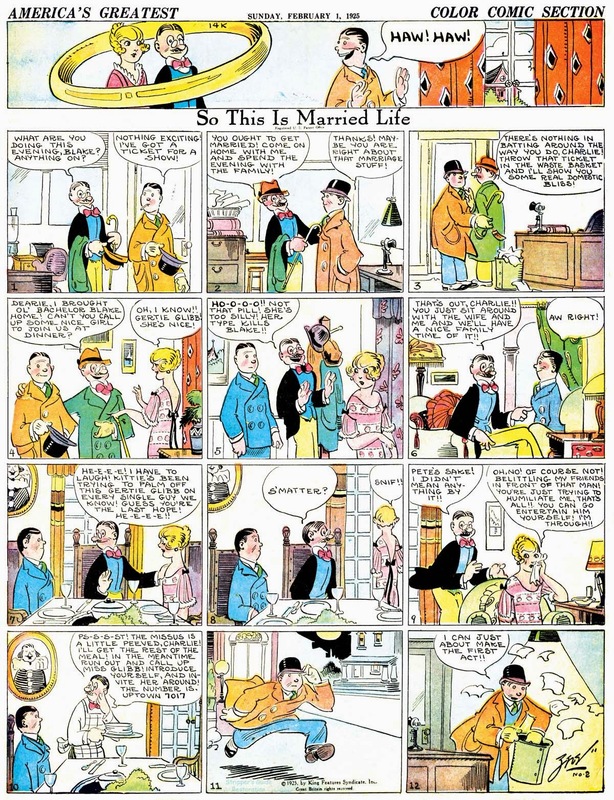 Just lost the ebay auction on 2 Original Forsythe dailies for a strip called Orville Nertz, dated ca 1940's. Not sure if it ever was published. I can email the images to you if you would like.